We wish you a Merry Christmas and happy holidays and a successful 2016 to come. 2015 has been an interesting year for MCM and we will do a review of our successes and failures things with improved, and weaknesses and strengths. Overall, as can be seen from the chart below market structure projection has been one of the strengths, and it has successfully projected the market out for many months now. These projections have not changed as they are rendered in the charts and remain relevant to market behavior. Weakness projected into  bounced as expected and began the latter part of a Santa Claus rally. The strength of the drop that occurred last week did not fit into the resolution of the weekly projections. However, if you do look at the daily projections which are the white lines at the bottom the chart you can see the morning to morning weakness that showed up during those days. Again, these renderings have not changed and remain relevant. This coming week as a potential to be a pronounced decline. For the January effect for this year, the average closing gain for the year is -9% or so. While we may not reach -9% next week has the potential to take us significantly towards this direction and caution would be advisable. This is certainly NOT an options being presently seen in popularity on the internet as most Elliott wave and technical analysts are distracted with triangles which in this analyst's option are way too obvious and accepted to follow expectations easily. Again, we wish you a very merry and safe Christmas and look forward to seeing you in the new year. Please come back to see our year-end review mentioned earlier in this post which will be posted soon. Last week was a tough week for risk assets as expected. The next few days are key as ideally timing for a bounce exists this coming week it is possible, however, this cycle inflection point can right translate and a turn from down to up may require more time. The reason for this is that we are now in the acceleration phase of double downward running correction breakouts. On a conservative basis, timing should be for Tuesday or Wednesday for a low. However a caveat implies that those "short" should consider trailing stops down rather than exiting shorts on any further weakness. Below is a chart of the weekly cycles - the turn has only just begun as per the rejection of the magenta resistance cycle - additionally, the cycle direction study is only just now beginning its reversal downwards and will require, at a minimum, a few weeks to reach the zero bound (See  and  on the chart). There will likely be bounces within any such move however, it appears that the market can easily reach the running correction targets of 1,940 or 1,800. Another anecdotal issue is that the FED is due to report their unbelievably tortured analysis and process geared to raise interest rates by only 25 basis points. However, at this point the FED credibility is pretty tattered and IF they raise interest rates they will be viewed as non-data dependent to the contrary of their propaganda. If they do not raise interest rates they will be show that the verity of their analysis and policies is likely sorely lacking. In either case, the best the FED can do is damage their credibility or damage it more. Not particularly wonderful outcomes and for the markets this could imply that no matter what the FED does will be received negatively. While we do not have sufficient data to build complete MSP on the HIGH YIELD asset class, there are some worthwhile observations which could be troublesome. While we are not comfortable with MSP setup for HighYield enough to publish it - here are some general observations: market structure projection on a broad basis pointed to normal probabilities starting last week into the Christmas time as among the most positive of the year. This is interesting, because when something deviates significantly from MSP then it's often likely something serious is going on. So far. is that is appears people were attempting to be set up for this potential strong upward move for HighYield and are presently getting stopped out. When people get trapped in trades and the market does not cooperate, things can often go as strongly opposite as they would be expected via MSP to go based on probability because people are caught by surprise. Technically, the MSP setup bullish for HighYield into Christmas, however, IF we have inverted and turned buyers into trapped sellers hungry to get out - then it is possible weakness can continue in HighYield until Christmas. We currently appear to be contradicting the probability projections of MSP for strength for HighYield - this could be A BIG PROBLEM if participants become trapped. 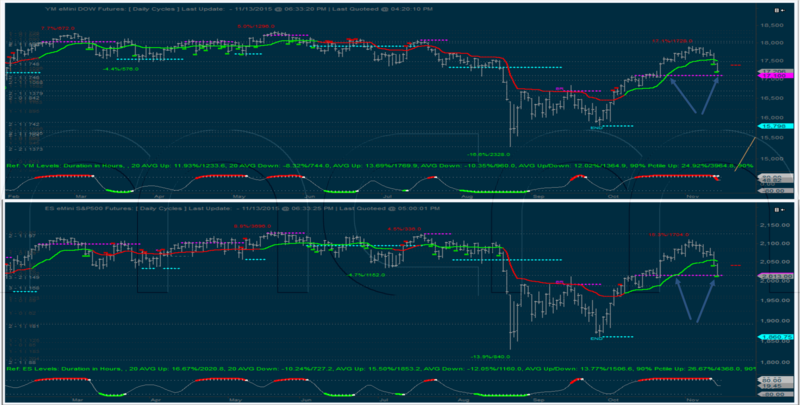 The DAX market has tracked MSP well and is looking for an interim balance into Christmas starting sometime next week. As has been posted throughout these pages by breaking below extremely strong capitulatory emotional selling extremes (X-Ticks) via eTickTools on a pervasive basis the markets triggered behavior unlike any that we have seen since before the August crash - putting it at potentially grave risk. IF NO BOUNCE OCCURS NEXT WEEK THEN THE IMPLICATIONS ARE DIRE. This has serious implications for the US markets as well as the DAX tends to lead the US equity markets and S&P500. It is, therefore, with the most concern and hope that we look for the markets to reward the low liquidity seasonality into Christmas with a win. However, the negatives are also pervasive in that NO analyst we see is really looking at anything other than upward triangles, falling wedges and wave 4's. We do not believe the equity market as a whole will be seeing new highs anytime soon - contrary to the very bullish general expectations it seems in the analyst space. In this article, we publish updates to the various MSP charts presented on these pages recently. As mentioned previously, there was a bug fix which corrected the significant misplacement of certain MSP points under certain conditions. The comparison and analysis demonstrating this problem is shown below at the bottom of this article. The result of this discrepancy is that the incorrect MSP did not track, but the correct MSP tract as well as one could possibly want. 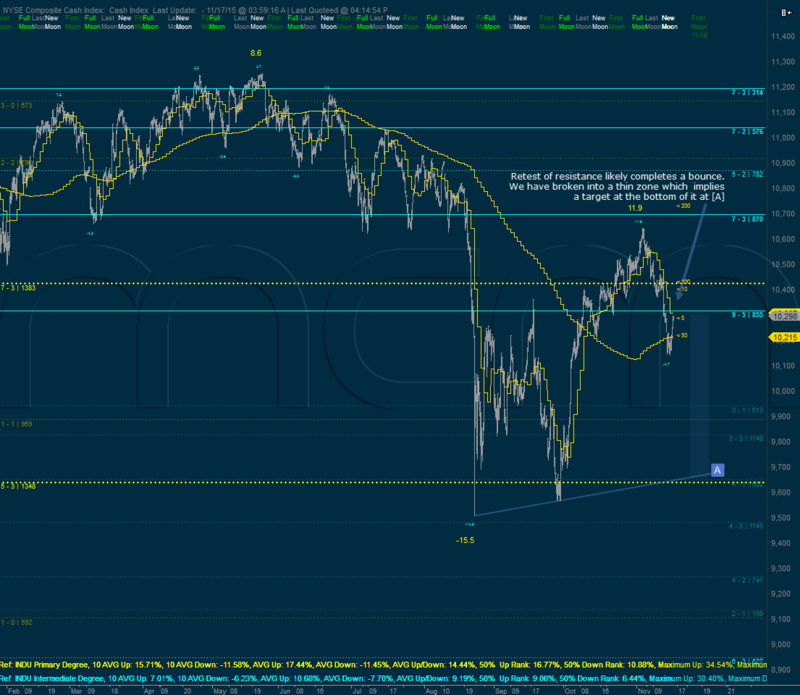 With that, the corrected MSP is showing an inflection point of this week for the S&P 500. Not only that it is showing inflection points potentially building up for the DAX and the bond market. The bond market rally seems to have been a very foreign concept. However, market structure projection got it right so far. Keep in mind, that the most sophisticated work we have done related to the equity indexes and market structure projection is being expanded to many other products - this is a process. One of the interesting things is that copper and gold, which had a high pressure for a turn in November have not tracked and diverged significantly from their projected behavior. This indicates that something else may be going on, and caution is warranted. In either case, the high probability area for gold to launch a sustained rally appears likely in January. This weekend we will present a host of unique charts and a detailed discussion of market structure projection, which had a software issue related to the end of November timing for a low - which actually due to a rare condition forward translated erroneously skipping the correct mapping for the week so the 16th. We identified this early last week and updated members, as soon as it became clear that future vs. historical MSP was not agreeing. This bug/error has been fixed and will be discussed in a separate post. However, inflection points are expected imminently if not already in. The cycle study shown in the large chart below (you will need to maximize or zoom into the chart to see the details) is a robust and proprietary analysis that we use in our proprietary trading systems. The objective of this study is to devine the direction and timing of market movement by backing out its natural oscillations - or waves. 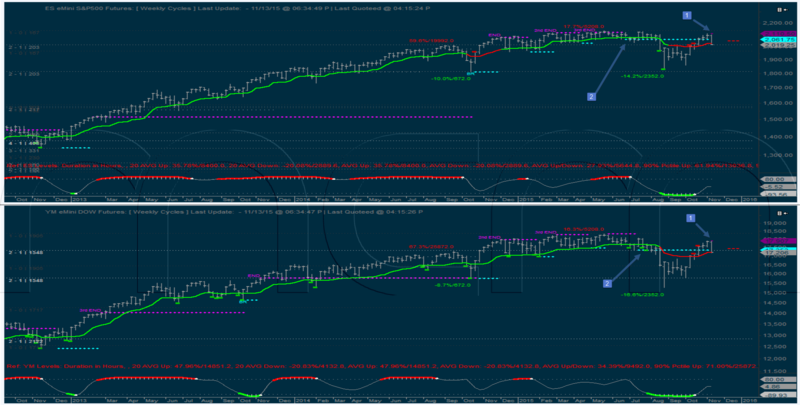 As can be seen in the chart below, the red and pale cyan studies at the bottom of this chart show the larger directional move in the markets. They show when a market is trending by magnetizing to the upper and lower bounds. This means the 100 and 0 levels. Persistent travel at these extreme bounds indicates a trending market as well as the direction of the trend. When markets attempt to change course, a period of questioning is required. These market questions show up as volatility or could be called CHOP. We are currently in a pronounced stretch of zero bound attention which usually occurs once a change direction has successfully occurred. These tools defined the change of direction in June and July this year from UP to DOWN and likely into a bear market. They could not have had better timing. The objective of these analyzes is non-latent and simple, we think that this has been accomplished in the chart we publish on this page. Additionally, there is another condition occurring similarly to 2007. 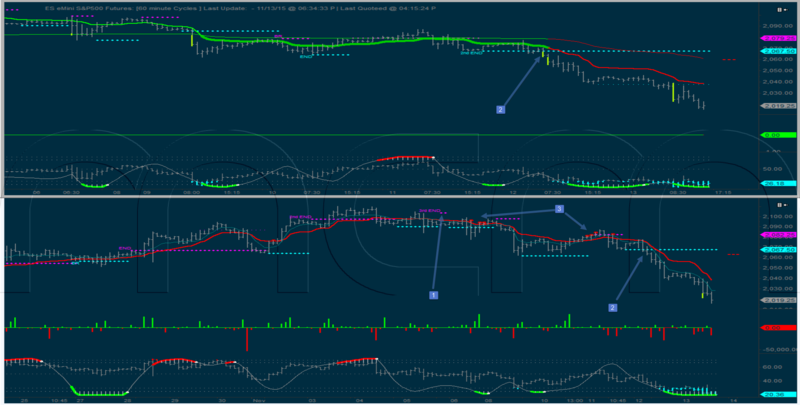 While it is not our objective to show systematic trading as an indicator. The RVS is an old and established trading system that has unique qualities currently potentially acting a bit like a larger-term indictor. RVS trades only with what it feels is the prevailing trend. During the last five years. While it has had many losing individual trade elements. It has scarcely had a losing model position since 2009 and its releases in 2010 and 2012. This means that every position, including all the entries required to build a position on an NET-BASIS, resulted in a profit this makes the system stable and persistent which is why we trust it and have not changed anything about it in years. Due to the characteristic of the system's trading only in what it perceives to be the prevailing market direction it believes most probable...and its ability to trade profitably and consistently through whipsaws that usually accompany changes in direction in the market, this system is now setting up a pattern almost identical to 2007. 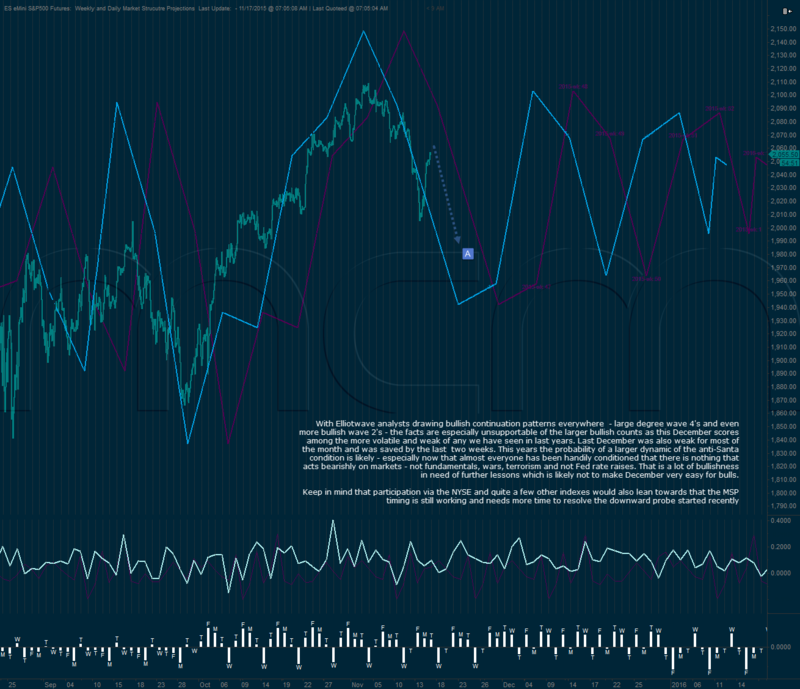 Within the cycle analysis, we are presently likely in initiating bear markets, similar to 2007. As such, RVS believed we were in a new bear market starting in July and profitably shorted (albeit small) the September and October bounces. The reaction of the markets since then has created the perception that the Bull-Is-Back. This can be seen via the many Elliott wave counts and technical analysis calling for new highs, dramatic or astronomical new highs. We believe that most of this analysis is founded in an emotional basis and lacking reliable or factual data. This reaction the markets also has so far attempted to convince RVS that longs are the preferred trades. If the expected inflection points play out and the cycle directional trend analysis is accurate, this phase for RVS should become a similar whipsaw as in 2007 and regardless of if markets make new highs (as in 2007) the system should soon revert to a preferred bias towards short risk. We will be posting a detailed article with updates to market structure projection which is suggesting and early month inflection point in December. However, plus or minus two or three trading days would not be surprising. Therefore, while it should be expected that we get a bounce as the new month kicks in, this bounce could be to a high. In either case, market structure projection is suggesting a potentially difficult period or balls ahead so it is a good idea to be alert for any weakness, as surprises are likely to come on the downside. This article is not about market structure projection. It is about additional information which is representing the quality and behavior of this current move. We have discussed consistently, the Russell 2000 and Mid-caps 400 in the lounge and on the site. Earlier in the week we pointed out that daily resistance cycles would likely trigger if weakness of any decent quality occurred for these indexes. This has been the case, and currently the charts shown below show an unconfirmed daily resistance cycle shown in dark magenta. At the end of today, the cycle will confirm at whatever price marks the recent high and the cycle indication will turn bright magenta. This cycle is significant in a few ways and may suggest a clean rejection of prices if it is respected. Not to be left out, the equal weighted S&P 500 index is represented below and has been showing ever increasing weakness, which translates to declining breadth, for the S&P 500 components. The index can be seen in cyan below. Additionally, the ratio of the equal weighted index to the cash market capitalization weighted index is shown in red. We can see that during this rally there has been a dramatic underperformance in the equal-weighted index ratio to the capitalization weighted index. All this suggests, less than reliable participation and large liquidations occurring within this up, move. We posted a few weeks ago, market structure projection gold has reached its inflection point at  in the chart below. While a smart 3 to 4-week bounce which could be significant would be reasonable, important point to note, is that goals has reacted at its expected timing and if we get a strong rally. The goal chart below suggests that the reaction to the Fed policy adjustment or activity may not be nearly as rosy as the stock market would like it to be. This chart says danger ahead. Last goals. Investors think that they are out of the woodshed, it also appears that after this rally a new low in January for gold is a high probability. The most bullish scenario for gold would be if a low in January was a divergent low meaning that it has a higher low than the current low. This is not currently the preferred view, but it is a distinct possibility and if it were to occur with the market structure low implied for January it could suggest a very large gold rally. Since, people are sufficiently frustrated and confused to be heckling and both negative implication and positive implication posts and articles. I figured it was time to update the market structure projection as we are getting a balance within a downtrend. The bounce is larger than I would have preferred but most likely is a bounce meeting a downward push. Normally, the first few days of December are probable of being bullishly inclined, hence the question of whether the low that we got last week was dramatically left translated as shown in the first box on the start or whether it needs to average to itself somewhere in the middle around the marked  comes up. Currently, systems that were holding long trades closed out yesterday at the close, which suggests that this rally is ripe. Moreover, we are approaching a time when people are looking for Santa Claus, yet all the data. This analyst sees suggests Santa Claus may not have quite so much spry in his step this season. We are entering the phase of weakness mentioned on these pages over the last weeks, which suggests downward bias into February or March next year. The posted NYSE charts also provide anecdotal evidence that we are at a pivotal market point. We suggest that you take a look at those charts again as the Hindenburg omen's their placement timing and patterns overall are concur with market structure projection at this time. Now That Everyone Need Never Worry About Equity Market Risk – Is the Worry Over? "Nothing shall interfer with risk markets" is now the popular determination...after the largest terrorist attack in years combined with horrendous economic data produced a large bounce - why worry? We tend to believe that this compunction is in for some more testing and that intervention will only go so far. VIX was in a position where, despite giving a valid signal, it is of a low-quality variety that would usually lead to a bounce but need a secondary signal for a larger and longer reaction. Having reach our 2010 to 2015 target the S&P was entitled for a bounce as would be normal for retests of previous upward impulses on the daily charts. Our systems that took longs into this area are not virtually flat and will close these trades at any time. This also would fit the MSP timing. The NYSE is in a remarkable bearish Head and Shoulders pattern that virtually no one seems to be focusing on. and moreover, the shorter-term pattern shown below is not too bull friendly either. The fact is, that we broke out into a thin zone with what would be called a full test. The normal and highest probability reaction for these types of event is a drop through the thin zone to the next supports as can be seen on previous events on the chart. 2.The resistance is expected to be quite strong and the normal expectation is for the market to head lower in the next 2-3 weeks until a support level is triggered, if the oscillating nature will hold. So despite having reversed the down impulse, the market is still expected to head lower in the next weeks. If that does not happen and the market can push through resistance, triggering an impulse up, that would need to be respected. Either way, the resistance levels triggered (2110.5 on ES and 17907 on YM) are now important levels to watch. 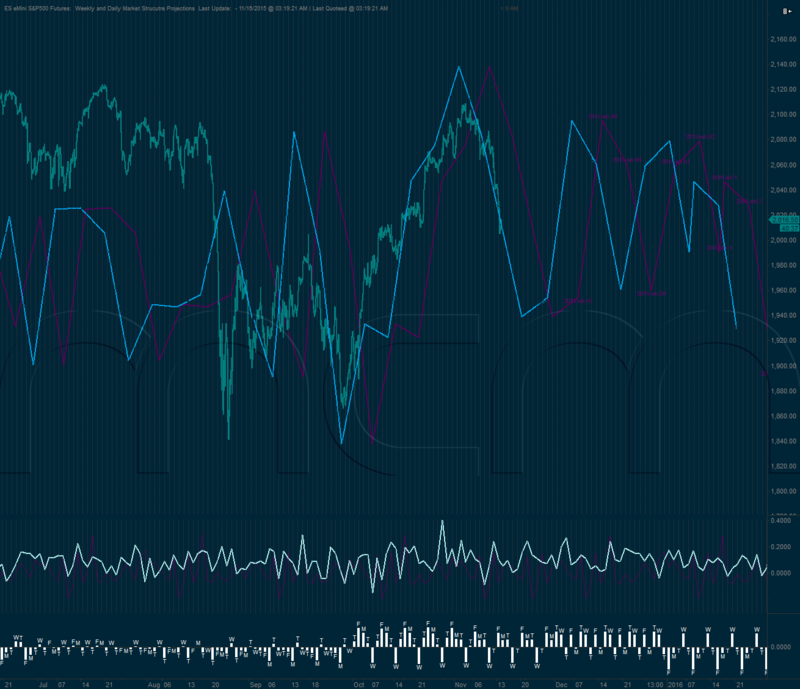 The daily cycles are still impulsing up and are currently back-testing their break-out level at 2015 ES and 17100 YM. In the last newsletter we were mentioning ”In the context of the weekly cycles this back-test becomes even more important and is not totally unreasonable to keep an eye out for it next week, considering the MSP.” That is still valid and it is important to see if the market manages to bounce and hold the impulses up or it reverses. The daily is also showing LREs for longs (lower risk entries), so at least a short term bounce is the normal expectation. If the market doesn't even attempt to bounce from around these levels, that would have very bearish implications. The 60 and 135min cycles had a significant development also last week. After we pointed out in the week before that they had finished their up impulses with a 3rd END (point 1 on the 135min chart, the 60min is too far back and cannot be seen) they oscillated for a bit and then both broke into down impulses (point 2 on the chart). An additional interesting point is that the 135min cycle had some LREs for shorts (Lower Risk Entries) - point 3 on the chart. These lived up to their name as market retreated quite significantly from there. For next week, considering where the daily cycles are, we could expect some sort of bounce to get a BR (Bearish Retracement), since the impulses down are now clearly established. We will be looking at the shorter time frame cycles (1,2,5 and 15min) for clues if that will play out, since they are fractals of the 60 and 135min cycles, and would normally break into up impulses on such a move. The MSP signaled very accurately the significant inflection point which came up in the market. Perfectly in line with the 1 week left translated MSP, which correctly identified also the bottom back in October, the market peaked in the indicated time window and lost close to 100 points from there. We draw the attention again that now there is bias for weakness for the next 3 to 4 months. This does not mean that there will not be any bounces. It simply means that it is likely that an important intermediate term top was put in and that the character of the market changed, favoring weakness.